Saint Tikhon Russian Orthodox Church is a growing community of believers seeking to be transfigured by the Holy Mysteries (Baptism, Holy Communion, and others) established by our Lord and God and Savior Jesus Christ for His Church. The parish is located in the city of Bristol, in the mountains of southwest Virginia. The church is a short drive from Johnson City and Kingsport, Tennesee. We are a young and growing parish with members of many diverse backgrounds and life experiences. We are blessed to be overseen by His Eminence Metropolitan Hilarion (Primate of the Russian Orthodox Church Outside of Russia). Fr Matthew Williams is our parish priest. 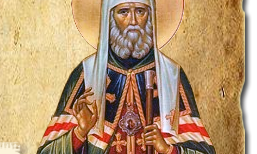 Although our parish is historically connected with the Church in Russia, Orthodoxy is the Universal Church and we extend a warm invitation to our Divine services (which are primarily in English) to all who are seeking out the ancient Faith once delivered to the saints. As Orthodox Christians, we strive to live our lives according to the commandments of Christ through the guidance of Holy Tradition and as affirmed in Holy Scripture. The services of the Church have been compared to a wedding feast, like that of Cana in the New Testament, where the Bride (the Body of Christ) mystically meets Her Bridegroom Christ, in the Eucharist. Should you have any questions about the Orthodox Church, or about visiting our parish, please feel free to contact Fr Matthew by phone (276-299-0212) or email (frmatthew@sainttikhonroc.org). We also offer several articles and discourses on this website for your perusal. Please feel free to contact Fr Matthew to schedule a special service of supplication (молебен), memorial service (панихида), confession (исповедь), or meeting.